CAMDEN – The teens gathered around the late model Surbaru Impreza, listening as instructor Patrick Moore explained not just how the various systems worked, but how they worked together to make the car run smoothly and efficiently. The 10 young men, all juniors and seniors at Mastery High School of Camden, had crossed Erie Street to learn about automotive technology at Respond Inc.‘s North Camden garage. But they’re not just learning how to change the oil and switch out spark plugs: Instead, this class is preparing them for high tech careers that are also in high demand. Cylus Baez said he’s been around cars for a long time, with his father and other family members working in auto shops and on their own vehicles. The 17-year-old said he wanted to learn automotive technology to open doors to greater opportunities. The same was true for Julian Salcedo, 16. According to the U.S. Bureau of Labor Statistics, the nation will need an average of 76,600 technicians trained to work on cars and light trucks through 2026. In New Jersey, those technicians account for 3,400 jobs each year, or 23,800 over the next seven years, according to the New Jersey Coalition of Automotive Retailers. But there are only 1,500 students enrolled in vocational-technical programs across New Jersey’s high schools. And while New Jersey voters recently approved the Securing Our Children’s Future Bond Act, which allocates millions to vocational schools and community colleges, no specific amount has been determined to vocational training, let alone for automotive tech training. State Assemblyman William Spearman, who dropped in on the class on a January afternoon, said he and his Fifth District colleagues are currently drafting a bill that might provide more direct funding for training like that offered by Respond, Inc. — legislation that he said would link companies in South Jersey and the rest of the state with the nonprofits that offer career training. The goal: Companies that have facilities in the region, like Subaru, Holtec and Campbell’s Soup, share with community colleges, high schools and nonprofits the skills they require for the positions they need to fill most. The institutions, like Camden County College, Camden County Technical Schools, Cathedral Kitchen, Respond and others, determine how much it would cost to train students for those positions, and the company covers the cost of training. Once students successfully complete the required training, they are hired by the companies, which in turn receive tax credits or other incentives. “If we can pull this off and get companies working directly with nonprofits and educational institutions, well, this gives us a way to make sure there’s always funding for training programs,” said Spearman. 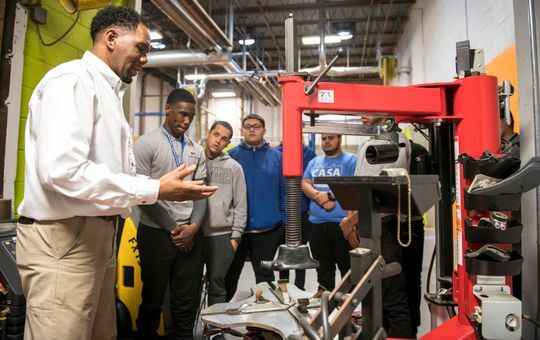 While Respond recently teamed with Mastery to teach high school students, the North Camden-based nonprofit also trains adults for careers in automotive technology, culinary arts and early childhood education. Randy Williams is rebuilding his life after being incarcerated for theft for the last three years. He attended automotive technology classes at Respond while living in a halfway house, graduating in December. He hopes to someday start his own business, buying used cars and fixing them up himself for resale. Respond also offers financial literacy, job readiness and life skills classes, and Williams took advantage. Respond’s students work on a late model Subaru Forrester, an Outback and the Impreza, all donated — along with thousands of dollars in other equipment — by the automaker, which just moved its U.S. headquarters to Camden. According to a recent NorthJersey.com story, trained technicians can make good money, with dealership techs earning an average annual salary topping $59,000. Hourly pay for automotive technicians in New Jersey is $23, or about $49,400 a year, according to the U.S. Bureau of Labor Statistics, with pay increasing along with experience levels, especially for those who work in dealerships or fleet management. Respond prepares students for Automotive Service Excellence (ASE) certification, the industry standard, for light-medium repair, said Moore. They learn the fundamentals of computer diagnostics, indispensable for modern automotive repair.